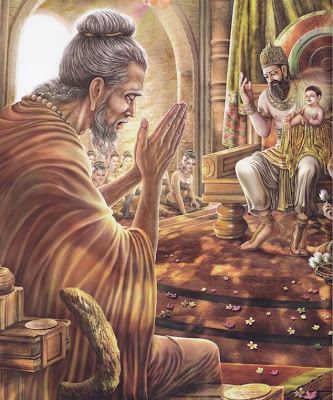 King Suddhodana and all the other Shakyan princes were given their education by a very virtuous and wise Brahmin called Asita. He was a sage who lived in the jungle close to the Himalayas. He spent his time meditating in a kuti there, when one morning he saw and heard the Devas singing and dancing in rejoice. On inquiring he found out that a baby son has been born to King Suddhodana and Queen Maya and that this boy prince would one day become the perfectly enlightened one surpassing all beings. When he heard this Asita the sage became delighted and hurried to Kapilawastu pura to see the King. When King Suddhodana saw him he was very happy that his wise old teacher has thus come to see his baby son, even before he could send message informing him about the birth of his first born. He brought the little baby prince to show him to the wise old sage, also for the sage to examine and predict his little one’s future. However, when he thus held the baby his little feet touched the Jathah (head dress) of the Brahmin. 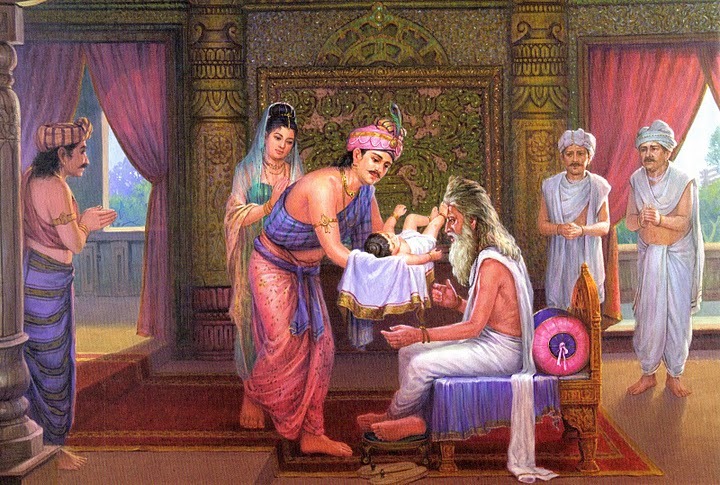 On the seventh day of Prince Siddhattha’s birth his mother Queen Maha Maya passed away, and thereafter, her younger sister Maha Prajapathi who was King Suddhodana’s second wife, looked after the baby like her own son. The mind is so subtle in this realm that it cannot be perceived nor not perceived. Extremely high practices of Samadhi (extreme stillness of the mind) brings about this situation. However, The Buddha realized that this is not Nibbhana.